Contact us for additional information regarding successfully engineering your yurt project. Why do I need Yurt Engineering? A yurt is a specialized structure not covered in the current building codes, so an engineered design is required by most permitting jurisdictions. The yurt relies on a balance of forces for stability. It has a compression ring at the peak, supporting one end of the roof rafters. The other end of the rafters is supported vertically by the lattice walls. The rafters' thrust load is resisted by the tension cable. The roof framing self weight (dead load) combined with the close rafter spacing provides a uniform stabilizing force, maintaining the circular shape of the yurt under both wind and seismic loads. A similar type of structure was used in the former Kingdome sports stadium in Seattle, Washington, USA. 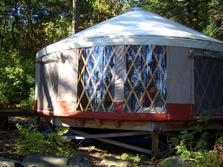 Additional benefits of the yurt are the symmetrical, aerodynamic shape, which helps to shed wind. The light framing of the structure ensures that seismic loads are not significant. The flexibility of the structure means that it will perform like a tree in the wind, deflecting elastically under wind gusts to shed the wind, then restoring to its original shape. It must also be recognized that the yurt is a non-redundant structure. It has only one load path, so any analysis of the structure must be thorough, and the structural performance well understood. Our structural design methods incorporate aerodynamic wind analyses to develop a realistic performance of the yurt under high wind loads. High snow loads are accommodated through higher strength rafters, stronger lattice walls, and additional posts and bracing. We have spent hundreds of hours developing these methods; our 15-year track record with 100's of successful yurt projects attests to our competence..
What is a Yurt? The yurt is a unique structure. Originally, it was a circular tent of felt or animal skins on a framework of poles, used by the nomads of Mongolia. The first yurts have been traced back to the time of Genghis Khan. Marco Polo, observing the nomadic people of Mongolia, noticed their sturdy, exactly-round tents made of rods, covered with felt, which they carried with them on carts. Yurts (or gers, as they are called in Asia), are still used today throughout parts of Russia, Mongolia and Siberia. The traditional yurt walls were made of slats lashed together with leather thongs to form a collapsible trellis or lattice. The lattice was set up in a circle and the door frame was lashed into place. The crown or center ring was set on two posts in the center of the yurt. Roof poles connected to the crown and rested on the top of the lattice, all the way around. Finally, the entire lattice is bound by a tension rope. Covers for yurts in Mongolia were constructed of felt, beaten soft by rolling and kicking the wet sheep fleece. In cold climates, up to six layers were used for insulation. Traditional yurts have been used in some of the most inhospitable and barren regions of the world: the deserts of the Sahara and Gobi, the Central Asian steppes, and the polar tundras. Yurts can be warm in temperatures of minus 40 degrees Fahrenheit and cool in temperatures over 100 degrees Fahrenheit. Though considered temporary structures by today's codes, modern yurts incorporate high-strength lumber, specialized foundation designs, and the latest in high-strength waterproof fabrics. Properly engineered, they have even more capabilities.